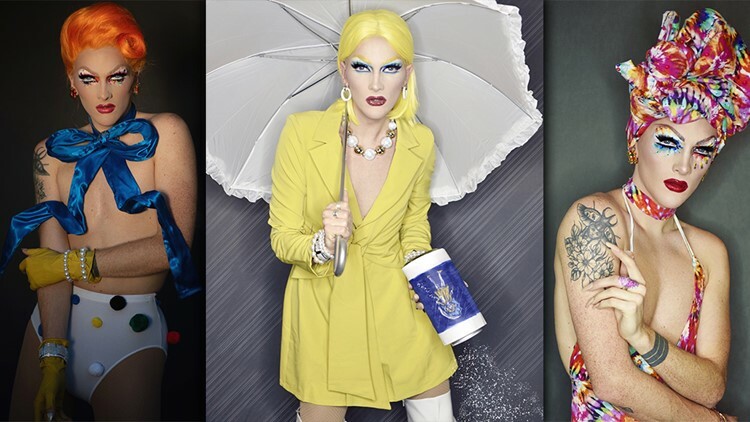 With the art of drag now as popular as ever, seven Austin drag queens take you inside their own bold and bustling drag scenes. AUSTIN, Texas — Amidst live music, tech startups and Sixth Street revelry, there's another bustling community thriving in the ATX. With a little boost from the mainstream success of "RuPaul's Drag Race," Austin has become a hot spot for another generation of artistry -- drag queens. Now, fans of the art form are hitting the streets in droves to become a part of the Austin drag community. From nightly shows on Fourth Street and Red River all the way to Brunch with the "Boys" at Alamo Drafthouse, now it seems you can find a drag show on any given day. 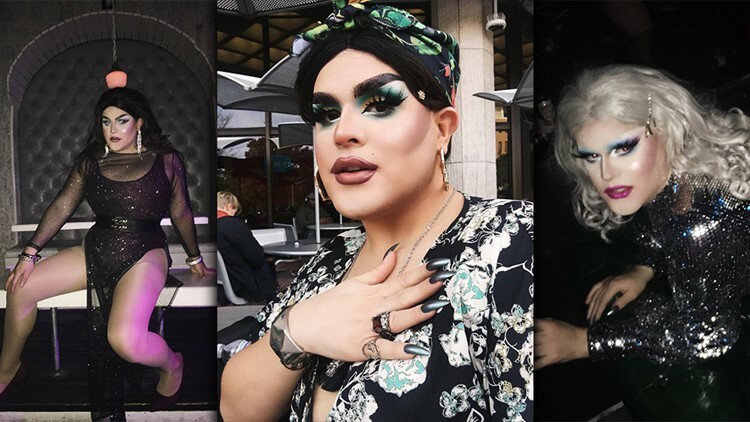 To help you find one that suits your fancy, KVUE sat down with seven local artists to dish about our booming drag community. So grab your ones -- or your twenties -- it's time to spill the tea. 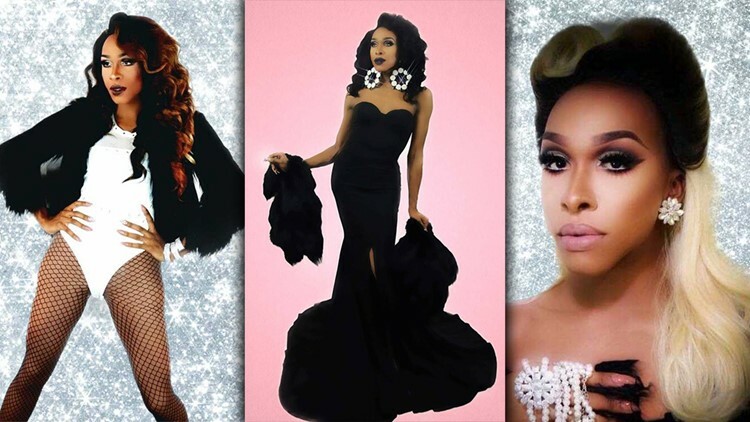 For Amber Nicole Davenport, the self-proclaimed "Legs of Texas," the art of drag inspired her at an early age -- and she hit the ground running. "My grandma came to me one day when I was in middle school and told me to go to my room and look on MTV -- and it was 'RuPaul's Drag Race' Season 1," said Davenport. "She had found me in the bathroom in my sister's clothes a few times and I think then she knew that that would be the perfect outlet for me ... I wanted to be that person on TV! It was honestly my destiny!" Until she finds her way onto your television screens, you can catch Amber Nicole Davenport performing at Tucked! at Highland Lounge on Fridays and Body Beautiful at Seller's Underground on Saturdays. "I’ve had the pleasure over the few years to work with girls and guys I could have never Imagined working with because we are all so different," said Davenport. "And I love that. I think everyone should be able to showcase their talents no matter what! It brings together a sisterhood." And in that sisterhood, she says it's important to show your support not just for your favorite queens, but for all of them. "We all have worked hard to get where we are," she said. "I understand you may have a favorite, but we are all doing the same thing in different ways. Support everyone, tip everyone. Let us know that you support what we are doing for you!" Follow Amber Nicole Davenport on Instagram. 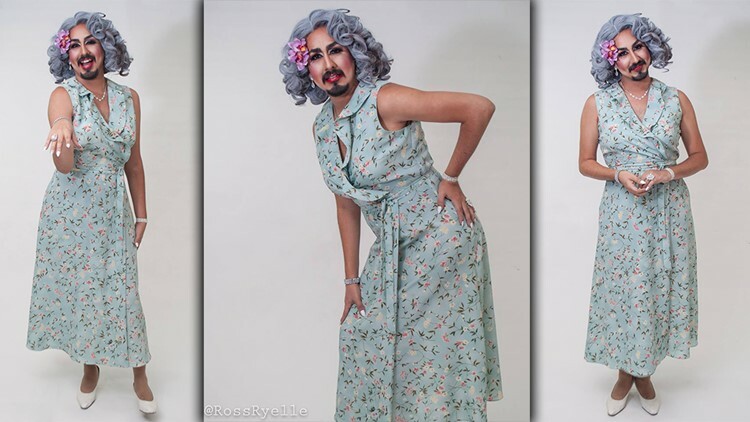 If there's one thing Grandma Steven can teach you, it's that the Austin drag scene doesn't always have to be about youthful fabulosity, it can also be genuine -- and geriatric! "Oh Lord, Grandma is a mess," said Grandma Steven. "I rely on being funny; I'm a comedy queen ... I have a shtick. I'm a bearded old lady, and I stick to it!" You can find Grandma Steven working her shtick at Loteria for Frida Fridays, various events for The Q Austin, at Seller's Underground for Crave and Body Beautiful, and at Drag Survivor at Oilcan Harry's. "I currently host Loteria for Frida Fridays, which is a marketplace for women of color to showcase and sell their art," said Grandma Steven. "I love it. It is so much fun to be immersed within my culture and contribute to the overall success of Las Ofrendas." While she may be a successful Austin drag queen, when Grandma Steven was born, becoming a drag queen was never really the goal. "On Halloween 2008, I went into my grandma's room, put on her wig and one of her dresses and went trick-or-treating," remembered Grandma Steven. "That's how it all started. So my Grandma Ester is the original inspiration." Austin thanks you, Grandma Ester! Follow Grandma Steven on Instagram. 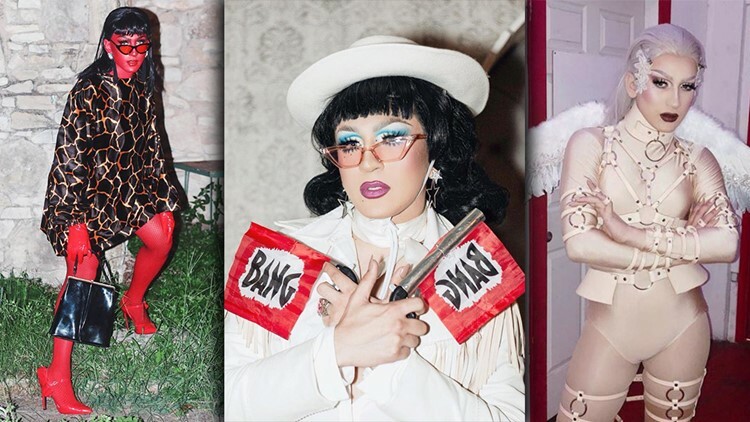 When it comes to drag as an art form, not many can keep up with Austin drag queen Hentaii. For her artistic looks, she often draws on other-worldly inspirations. "A lot of people call me an alien," said Hentaii. But for her, drag means so much more than being a space oddity. "A book written around the turn of the eighth century called 'Liber Monstrorum,' or book of monsters, lists its very first monster as a man who appeared physically, from his upper body, to be more like a man, but who enjoyed being and living as a woman," she said. "I have received (and continue to receive) a lot of abuse in my life because of who I am. That sickness is embedded into our culture, so Hentaii is about imagining a queer desire that can somehow undo that damage." Hentaii has taken that abuse and warped it into success, which is evident in the growing list of shows she's produced since moving to Austin after earning a degree in theatre studies at Texas State University in San Marcos. "//sub.rosa is the first show I started in Austin, one year ago this month," she remembered. "It's a sort of fine-arts-meets-performance-art, a theatre type of drag show inspired by the artistic and philosophical movement called surrealism." While creating the show, she said she wanted to find a way to detach drag performers from alcohol sales and focus more on the art form and the performers themselves. "I started the show with the hope that it would empower performers to see themselves as artists, free agents, and to inspire other drag queens around town to start their own shows that reflected the changes they wanted to see in our broadening community," she said. "I think it worked, actually." In addition to //sub.rosa, you can find Hentaii performing at shows like Violent Fem, Sad Girls Only and the occasional PooPoo Platter. Dubbed Austin's best drag performer by the Austin Chronicle, you can't dish on Austin drag without mentioning Louisianna Purchase -- probably because she's cast a spell on it. "At the heart of Louisianna, she is a femme fatale ... a seductress with a talent for witchcraft," said Purchase when asked to describe her spooky-yet-sultry drag persona. Drawing on inspirations like late night B-movie horror, pinups and vintage fetish illustrations, she may look gorgeous, but she has a bit of advice for new drag fans who think they can lay more than just their cash tips on her. "Tip and don’t touch me unless permission has been given," said Purchase. "And, dear God, stop trying to compare every queen to a 'Drag Race' queen. It’s not cute. It’s lazy and shows that you’re not a real fan of drag at all." Real drag fans can find her performing at her many Austin showcases, such as PooPoo Platter at Elysium on Red River. "[PooPoo Platter] is special to me because it’s where I got my start," Purchase said. "I also co-host Die Felicia, a drag horror variety show, with my sister, Zane Zena. Ruby Knight and I started a show at Sahara Lounge called Sad Girls Only. The cast performs sad songs and we serve cake before the show!" While she's made quite the name for herself in the Austin drag scene, Purchase said she and her many drag sisters -- and daughters -- have created a family. "The Austin drag scene is exciting and varied," said the queen. "Not being on a coast, we’ve made our own close-knit scene that pushes and celebrates our queens. There is literally drag happening almost every night of the week, all over the city." Follow Louisianna Purchase on Instagram. Just like the pasta, Noodles can be salty, creative and, with the right amount of hydration, bust a hunger you never even knew you had. "Noodles is a crafty, comedic chameleon," she said. "It doesn’t matter if her outfit is made from felt, paper or actual fabric, as long as it gets the job done and looks cute. She’s always trying to evolve and change up her look, but likes to keep a humorous or campy element involved." That humorous and campy persona has allowed Noodles to spearhead a few shows of her own at Cheer Up Charlies -- Half Baked and Salty. "Both of them mean the world to me because the feeling of having an audience come to see your show is so magical and unforgettable," reflected Noodles. "Half Baked is amazing because, to me, it just feels like I’m hanging out with my friends, talking, joking and really letting my personality (as well as the other queens) shine. Salty is a roast and it is fun because it showcases my sense of humor and comedy. They say laughter is the best medicine, so getting to make people laugh is even better." 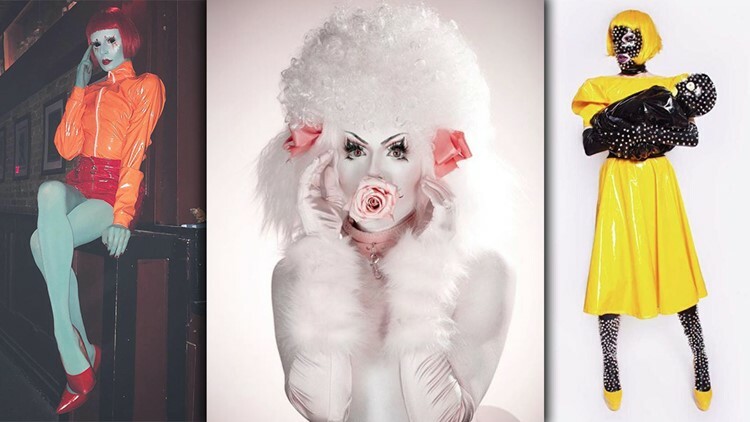 In between all the shows and performances, drag is more than just art for Noodles. For her, it's an outlet for self-exploration. "For the longest time, I felt like [Noodles] was different from my everyday persona, but I’ve come to realize that she is my outlet to let my personality shine through and give me more confidence when I’m not in drag," she said. "Because at the end of the day, it’s all me, wig or no wig ... I just happen to look much more fabulous in a wig." As a native Austinite, Ruby Knight has seen the local drag community grow since before the popularity of "Drag Race," eventually becoming one of Ausin's best herself. "The drag scene in Austin is full of a lot of greatness," said Knight. "So many types of talent from mesmerizing you into staring in awe, while others create so much fire with their energy, it just radiates off them and you can’t help being captivated. It's really such a wonderful fantasy of rich personas with exploding creativity." You could say Ruby Knight was created after a brief stint studying photography and painting in San Francisco, where she attended a class about drag and cinema. That quest eventually brought her back to Austin. "Ruby Knight in her first edition was a drawing of a drag queen supermodel with a striking vintage name that rang timeless," said Knight. "And in many ways, I hope I’ve continued that in bringing her to life. I see two sides to Ruby Knight: Ruby, the soft and doe-eyed romantic; and Knight, the deviant battle cry." Drawing on inspirations from runway models to female musicians, Knight has made her own mark on the city she calls home through her own drag showcases, like Violent Fem at Swan Dive and Sad Girls Only at Sahara Lounge. "Violent Fem is about strong feminine energy and letting the performer showcase that however they see fit," she said. "And Sad Girls Only is the third Monday every month and held at a tucked away clubhouse. All the queens perform beautiful, intimate numbers against a stage covered in carpets and draped fabric. Super dreamy and cathartic and, of course, themed to all of your favorite sad songs." And like her fellow Sad Girls Only co-host, Louisianna Purchase, Knight also had some advice for drag fans. "My number one word of advice is, if you like the number, tip the queen," she said. "It sounds like such a money grab, but queens are underpaid and support themselves with drag usually as a part-time or full-time job. Tipping is one of the main ways to show a queen you are supportive of her drag and admire what she does." Follow on Ruby Knight on Instagram. Finally, representing Austin's Latinx community, there's the spicy, telenovela-obsessed Tatiana Cholula. "What inspired me was my innate nature to perform and to immerse myself into a community of queer artists," said Cholula. "I would describe Tatiana Cholula as a mixture between a succubus and that intimidating telenovela villainess. She might look very beautiful, but she has a dark side." Cholula has used that fierce persona, along with her Mexican upbringing and fascination with pop culture and fashion, to develop her own drag show, Joterías, an event she said aims to highlight local queer people of color and Latinx talent. "So this is the show encompassing a four-member cast of Latinx performers of different backgrounds and stories," said Cholula. "Each month we invite different local queer people of color and Latinx performers to participate and make the audience gag on their talent." Aside from tipping your queens, and following @atxdragupdates on Instagram for all of the latest show listings, Cholula just wants Austin drag fans to have fun. "First of all, have a good time," she said. "Seeing audience members enjoying our numbers makes everything so worthwhile. But also have some respect for your performers, meaning not stepping into our performance space or touching us without our consent." You can catch Joterías at Hive Mind Hair Co. Follow Tatiana Cholula on Instagram.